With such a vast array of flavours, dishes and regional specialties, it’s no surprise that Japan’s capital Tokyo, has been awarded the most Michelin Stars in the world, defeating culinary superpower Paris for 11 consecutive years. 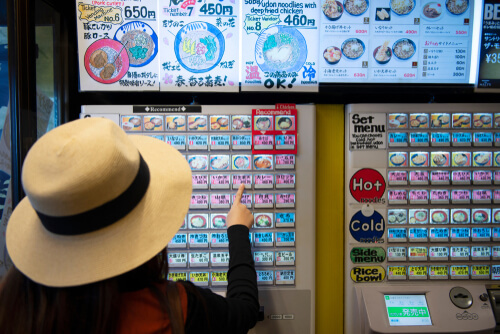 Wander through any of Japan’s largest cities and you’ll find countless restaurants of all types and dining styles whether you’re seeking high-end cuisine or discount ramen from a vending machine, there are dozens of options on every street. While dishes in Japan are highly varied, most involve a protein – whether it be meat or tofu – and are served with rice. Thousands of years ago, rice was much more than a side dish: it was an integral part of the Japanese economy. Before physical currency existed, regions around the country were required to pay taxes in the form of rice to the government, based on their annual yield. Thus, cities with the optimal climate and land geography for rice crops were the richest while places in the mountains with long winters were typically poor. In modern society, rice has been replaced by the Yen, but the side is still a staple component of dishes across the country. Another important thing to note about Japanese food is its regionality. Travelling through Japan is a true gastronomic journey, as each prefecture has developed its own version of dishes based on their climate, topography and location. Cities by the ocean tend to specialise in seafood, while mountainous regions that experience harsh winters are famous for hearty hotpots. Osaka is located in the south-central region of Kansai on the island of Honshu. While there are countless dishes associated with Japan’s third largest city, a favourite of both tourists and locals alike is Kushikatsu. 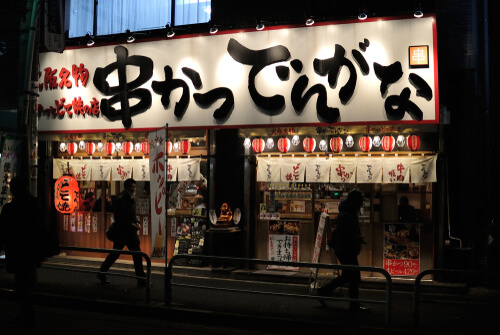 Kushi, meaning skewered and katsu, meaning deep-fried cutlet is widely available across Osaka but is said to have originated in the quirky district of Shinsekai. In the late 1920s, a restaurant called Daruma started serving variations of Kushikatsu to the blue-collar workers in the area. Ingredients like beef and potatoes were pushed onto skewers, dipped in panko batter and deep fried until golden. Before long, the dish proved a hit due to its simplicity and cheap price. Today, Daruma’s original bar-style restaurant welcomes customers seven days a week, in addition to its 11 other branches across Osaka. Just remember, there’s a right and wrong way to eat Kushikatsu. Whether you’ve ordered meat, seafood or cheese skewers, you absolutely cannot double dip into the communal bowl of sauce. The angry man at the front of each restaurant is a constant reminder to dip generously before your first bite and if your skewer isn’t sufficiently saucy, free cabbage is available to scoop more onto your plate. Kyoto has long been considered the cultural capital of Japan, with its traditional temples and immense history. The prefectures moderate climate enables good growth and farming, however, its most famous food is a plant-based protein: tofu. Originally consumed by Buddhist monks who frequented the Kyoto area, the dish has evolved over the years. While tofu is generally available throughout Japan, there are several reasons why Kyoto is ideal for its production. Tofu is almost 90% water and Kyoto’s lush, mountainous geography allows for excellent quality water and ideal soybean growing conditions. The ingredient is incredibly healthy being high in protein and essential vitamins. It’s also extremely versatile and restaurants around Kyoto are masterful at transforming the dish from dull to extraordinary. 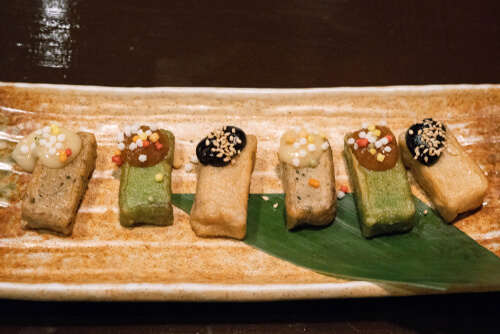 Typically, restaurants in Kyoto offer several types of tofu as part of a Kaiseki-style multicourse meal. Two highlights are tofu dengaku and yudofu. The former is a type of skewered tofu marinated in delectably sticky miso sauce, while the latter sees tofu served in a warm, dashi broth. Okonomiyaki is one of the most versatile dishes in all of Japan, yet is typically served one of two ways. The dish whose name literally means ‘anything you want grilled’ has been around for centuries, however, it evolved in Hiroshima post-World War II at a time when rations were sparse and people had to be creative with cooking. Unlike the Osakan version which is mixed together before cooking, Hiroshima-style Okonomiyaki is made in layers on a hot plate. First, a thin pancake of batter is cooked before ingredients like noodles, cabbage or pork are seasoned and added on top. The finished dish is topped with special sauce and aonori (dried green laver) flakes. Traditionally, okonomiyaki is eaten directly off the hot-plate with a spatula, but chopsticks are also encouraged. With its reputation as the world’s leading culinary city, dozens of dishes hail from Tokyo’s dynamic streets. 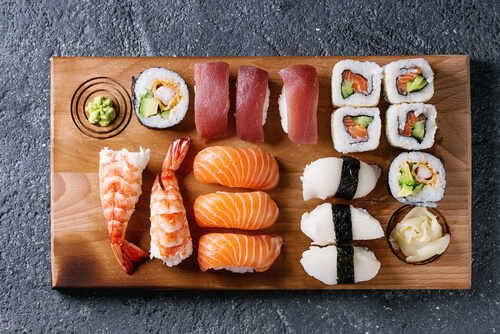 Among them is perhaps the most famous, nigiri. A form of sushi made up of thin seafood slices on top of vinegared rice, nigiri is said to have developed during the Edo period. While similar variations of the dish involving fermented rice had existed in Asia for centuries, nigiri was the first portable version where the fish and rice could be eaten in one bite. Over the years, the act of sushi-making transformed from a humble street food into somewhat of an art form. Today, a sushi chef typically trains for years before they are considered skilled enough to prepare the perfect portion but chefs outside of Japan are not usually as adept as their Japanese counterparts. In Tokyo, the best place to eat nigiri is from the fish market. Every morning since the early 1900s, chefs from Tokyo’s finest restaurants have ventured to the central fish market to bid on its fresh produce. While the Tsukiji fish market has recently been relocated to Toyosu, some of Japan’s finest seafood is still available to the public at the original outer market, with a hefty yet justified price tag to match. Ramen is a dish common across Japan with countless variations based on local and seasonal produce. One particular place famous for its take on ramen is Takayama, a quaint city in the mountainous Chubu region of central Japan. Due to its geographic location, Takayama endures bitterly cold winters, making dishes like ramen an essential comfort food. Takayama ramen tends to feature curly, chinese-style noodles rather than regular wheat-based noodles and the broth is soy-sauce based with bonito flakes. As with regular ramen, it is typically topped with chashu pork, spring onion and a hard-boiled egg. Compared to a regular tonkotsu broth, Takayama’s base gives it a deliciously complicated flavour profile and a stronger umami flavour.